Most of us know that to draw “in perspective” is to create the illusion of receding space on paper. Finding the horizon line and vanishing points help artists to understand, and to show, how things line up systematically in relation to our eye level. This is called linear perspective and it can be a very helpful tool, or a very confusing puzzle, to an artist facing a scene. 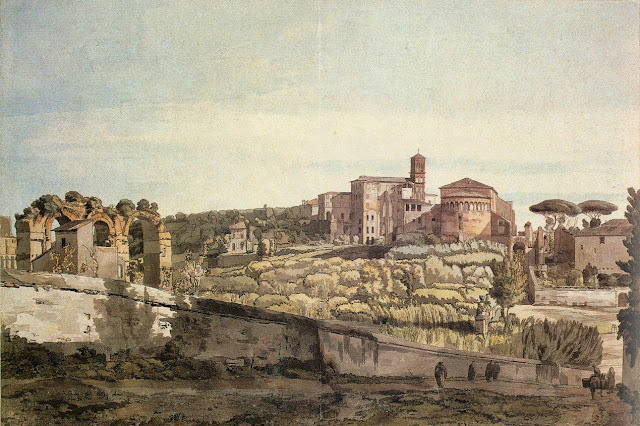 The development of perspective drawing is considered to be a major breakthrough of the early Renaissance. What fewer people consider is that there is another kind of drawing perspective that helps create the illusion of space, and that is atmospheric perspective - otherwise known as aerial perspective. Using atmospheric perspective means reducing the focus and the contrast of things in the distance of a picture in order to suggest space. If we stand on a tall hill, we can notice that things in the distance are affected by the atmosphere between us. We are very familiar with the fact that objects lose details to our eyes, the further they are away. But also, if we were to hold up a piece of black or white paper, we'd see that far away things are reduced to a middle value, or darkness. Color, too, is affected by the atmosphere, casting a blue tint. Recently, I came across two drawings created side-by-side in the late 1800's, by the terrific on-site artists, John Warwick Smith and Francis Towne. They were both British artists living and drawing in Italy. Comparing drawings such as these is so interesting because it reminds us that making art is making choices. These two artists drew together, but made different choices. Even though they shared similar views, art materials and drawing styles, there are still clear distinctions between the works. For example, clearly, Smith was more interested in the foreground element of historic ruins - something that Towne overlooks completely. 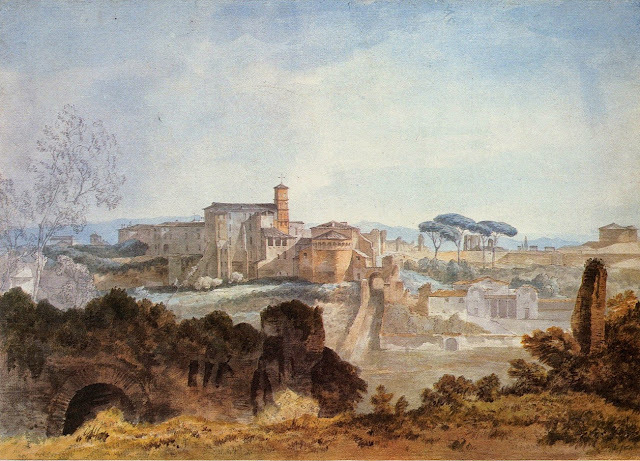 More to the point, Smith uses "atmospheric perspective" in his picture as a device to to help focus his interest on the foreground ruins and contrast them with the distant town. The town is literally pale in comparison. Francis Towne, on the other hand, considers everything before him equally. There are only subtle differences between foreground and background, and that's because he has made the choice to talk about everything as a whole. He sees everything as equally important in his drawing. So, which drawing is correct? The most important perspective is the artist's perspective - which is the point of the drawing itself. All the choices of an artist follow that.